VIP 2 harps on the premise of unemployed engineering graduates’ plight in Tamil Nadu. This sequel to Velai Illa Pattathaari (VIP) attempts to score at the box office solely on this premise and the big success of its predecessor. The audience however find out from the start that sequels all too often don’t work. VIP 2 is a glaring example of this sad phenomena. 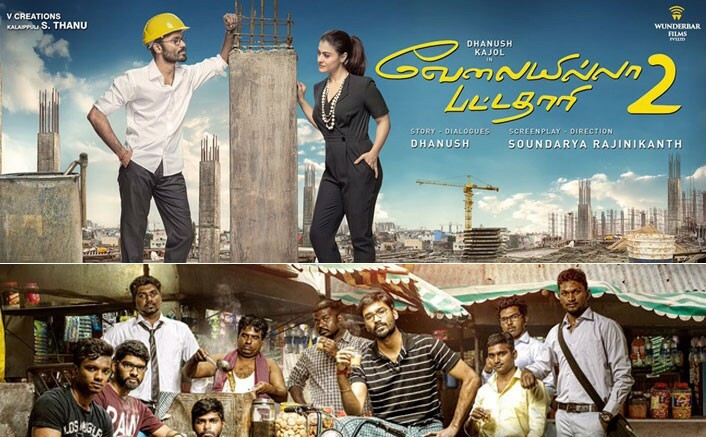 VIP succeeded in romanticising the oft-quoted glut of engineers in India with Raghuvaran played by Dhanush taking on a corporate bigwig and his overzealous son using his indomitable fighting spirit (at times literally) and pooling the resources of unemployed engineers. In VIP 2, he faces off with another corporate predator Vasundhara played by Bollywood’s Kajol whose sole mission it seems is to get Engineer of the Year awardee Raghuvaran working in her firm. The movie directed by Soundarya Rajinikanth is littered with semblances of scenes, situations and even dialogues from Rajinikanth hit movies. Like the confrontational scenes between Raghuvaran and Vasundhara very similar to the face-off between Padayappa and Neelambari in the Rajinikanth-Ramya Krishna 1999 movie, Padayappa. Obviously Soundarya is a huge fan of her father’s. But such borrowed material does not augur well for today’s moviegoers who prefer to move away from the rhetorics of past millennia formulaic movies generally custom made for leading actors. The intention of bringing Kajol into the movie probably augured well for the promotional stint. But it appears as if the movie hoped to hinge on her popular appeal and name for its success. Which is again a damper for today’s audience. Kajol’s saving grace for the movie seemed to be her good chemistry in the reconciliatory scene with a relaxed and down-to-earth Dhanush, trapped together in her office due to floods. The movie seemed to be over in a flash following the usual climax fight scene. Hardly worth the money paid for the ticket it would seem.